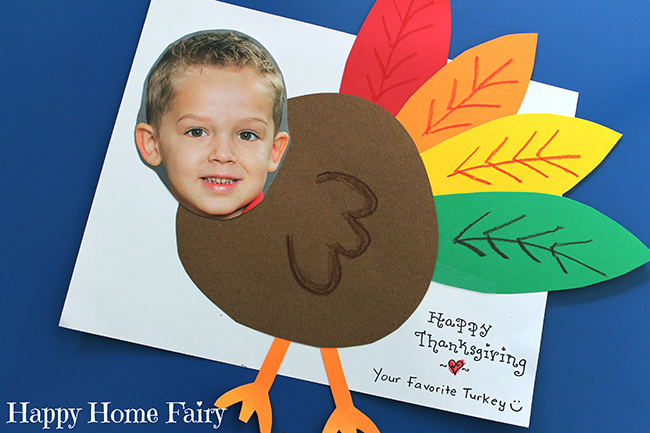 This is the cutest and simplest idea ever for a Thanksgiving card! It’s courtesy of Julie of Happy Home Fairy, who made these cards this year with her son. Behold the adorableness that happens when you… turkey yourself! The turkey is made by gluing hand-cut pieces of colored card stock to heavy white paper, so this craft really couldn’t be easier – especially given how completely precious it is! For another great bit of Thanksgiving inspiration from Happy Home Fairy, check out this list of random acts of kindness you can do during the Thanksgiving season. LOVE. Reposted gratefully with permission from Julie of Happy Home Fairy. Awesome! I love cute and easy!!! Love this! What size is the white paper? What kind of paper is it? What size is the photo? I don't know, sorry! Someone else made it, I just reposted it.